The Algarve is composed of 5.411 square kilometres with approx. 395,000 (Year 2001) permanent inhabitants. This figure can swell to over a million people at the height of the summer. Its administrative centre is Faro controlling 16 Municipalities, who in turn govern a total of 77 Parishes. The length of the south-facing coastline is approx. 155 kilometres and stretches about 52 kilometres to the north on the west. At the widest point to the north, it is approximately 36 kilometres deep. Communication is by road but there is single-track railway line running from Lagos to Vila Real do Santo António that also links to the line running to Lisbon and the north. The old "EN125" main road runs along the whole coast and has now been greatly replaced by the new parallel motorway "A22" (also known as the Via do Infante), starting at the border of Spain and stretching west to Lagos. Close to Albufeira it joins with the motorway to Lisbon. This motorway will take the visitor from the Spanish boarder at Vila Real de Santo António in the east to the historic town of Lagos in the west in a little over one hour of driving, thus now making the whole Algarve very easily accessible. There is one international airport located close to Faro and this conveniently lies in the middle of the Algarve coastline. There are about 100 sandy attractive beaches washed by the Atlantic Ocean and due to the maritime shelf and water currents the sea temperature can be surprisingly warm even in some winter months. Located on the tip of Europe with the vast ocean of the Atlantic as its southern and western border, this enviable position gives this region possibly the most unpolluted climate in the European continent. A good place to visit all year round. On summer, the coast between Faro and Lagos attracts thousands of visitors, but it is possible to escape from the crowds even in popular places like Albufeira and Portimão. Faro itself is worth a visit. The colourful Tavira is a good base for an excursion to the lagoons of Eastern Algarve, while in Lagos you easily arrive to the south-western beaches of the Algarve. In the more interior locations, the towns are more relaxed, with luxuriant vegetation, cultivated and wild. Monchique is an area of great beauty, excellent for strolls. The Algarve has a lot to offer! The mythical atmosphere surrounding Sagres and Cabo de São Vicente (Cape St. Vicente), places dedicated to the gods for thousands of years. The unspoilt coastline, with dramatic horizons of cliffs and sea. The many menhirs that bear witness to prehistoric rites. Memories of epic of the Discoveries and the enigmatic figure of Prince Henry the Navigator. Such are the attractions of Vila do Bispo and its municipality, a vast triangle in whish the sea is a constant presence. And where nature combines with history to create a unique region that is worth taking the time to get to know. Gigantic sculptures carved by the pounding waves that plunge into a crystal sea. The iridescent greens of sea caves. Beach after beach of soft sand tucked away between ochre cliffs or stretching clear to the horizon. Verdant countryside dotted with the white of houses. Just a few reasons for visiting Lagos municipality and discovering one of the most attractive parts of the Algarve. First the blue sea and its gently lapping waves. Then fine, golden sands framed by cliffs and rocks. The cosmopolitan atmosphere of an international tourism destination. This is the Algarve of beach holidays in the sun. Portimão and its municipality have more to offer though. A rich heritage of historical monuments. The eternal natural beauty of the Ria de Alvor. The charm of cultivated fields, of slopes covered with pine trees and wild flowers. The allure of walking up into the hills and looking down on the Algarve from a new perspective. 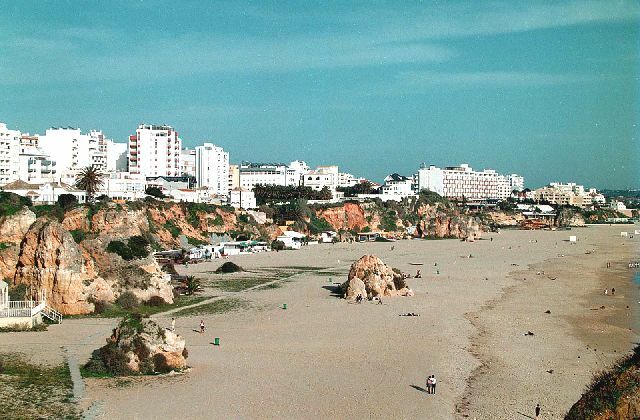 First and foremost, Albufeira is famed for its beaches, for the countless shades and tones of its rocks and cliffs. This is a place where people live to the rhythm of the great holiday destinations, sunbathing during the day and at sunset flocking to enjoy the restaurants, bars and discotheques that enliven the night-time hours. Just a few miles inland and everything changes. The green of the countryside is dotted with almond, fig, orange and pine trees and decorated chimneys stand out against the ochre of tiled roofs. Bucolic villages invite you to experience a way of life rooted in the tranquillity of nature, to add another dimension to your holidays. Firstly there are the islands, long sand banks that are an ideal spot for swimming and sunbathing. Next come the tranquil waters of the Ria Formosa, a unique natural habitat teeming with plant and animal species. And in the background loom the hills of the interior, ringed like an amphitheatre, covered with orchards, doted with white cottages. Three distinct environments, each with its special charm, which make Olhão a great place for a holiday. Beautiful empty beaches with sands that seem to go on forever. Fields of orange trees, heavy with the scent of blossom. Then hills of fig and almond trees and houses with dazzling whitewashed walls and distinctive chimneys decorated to resemble the fine tracery of lace. And, last of all, the great open spaces of the hills, where eagles soar, birds sing and flowers bloom. This is just a hint of the charms of Tavira and its municipality , an invitation to come and find out more. Apart from the high quality International cuisine, the Algarve also has to offer a great variety of delicious regional dishes. There is no doubt the Algarve has a taste of its own. A good vacation deserves good cuisine and throughout the Algarve you'll find several types of fish which the chefs recommend to be grilled or cook in more elaborated ways. Tuna has been for decades the king of our cuisine. You'll find it cooked in numerous ways: steaks, with clams or "estupeta", but you'll always find it delicious! You must also try the typical "caldeirada", the clam or seafood "cataplana" and the grilled sardines. Fried Cuttle-fish with ink and octopus salad are other specialties to consider. And naturally you'll also find all sorts of seafood. Concerning deserts, we have to make a special reference to the fig pastry, the eggs and almond pastry shaped has fruits or animals and the famous "D. Rodrigo". You'll also have to try our wines from Lagoa, which are internationally known, the ones from Lagos and Tavira and our many regional liquors. Transparent sea means the chance to practice all sorts of water sports, from scuba diving to windsurf. Surfers find the best waves in the Northern coast of Sagres. Active vacations in the Algarve are, also, the intense hours of a tennis match and the pleasure of playing golf in the over two dozen courses. Because it is always a good time to practise sports in the Algarve, 365 days a year. The weather is a strong ally to the practise of tennis. In the Algarve, you will find a complete offer of tennis courts and equipment. That will help you relax and keep in shape, or to make a competition with friends. Horse riding is an activity spread all over the Algarve, since it has been practised regarding education, and therapy objectives. In the region, you can find several learning centres, that are appropriate for every ages and skills. Here, you can ride and enjoy beautiful sights and landscapes. All along the shore of Algarve there are several diving schools, that allow you to see the beauties of the ocean. For those who are not professionals, there are special lessons. To practise this sport, you don't need much skills, just persistence, and a great concentration, since if don't follow certain rules it can be dangerous. First of all, you have to check the weather conditions and then you can fly over hundreds of kilometres of the shores and landscapes of the Algarve. To practise it, you need to contact professionals in the area. If you look at a map of Portugal and run a pencil along the Algarve, there is barely a centimetre distance between one Tee and the next. Roll comfortably along the EN-125 motorway from Faro and all exits lead to golf. The greatest concentration of Algarve courses are less than an hour away from Faro; there are 25 golf clubs along this particular coastline. Quinta do Lago launched Portugal's reputation as up and running in the holiday resort stakes. It was created to cater for sporty people; it does just that and golf is its paramount attraction. The Quinta do Lago and Ria Formosa courses are the focal point of a 2,000 acre golf and leisure complex. Also set in Quinta do Lago is Pinheiros Altos which features two contrasting halves of the 18 holes, each with diverse and stimulating hazards. San Lorenzo is currently the star at Quinta do Lago. Inaugurated in the late '80s it has been rated the Number 2 course in continental Europe. Between Albufeira and Lagos are another half-dozen courses; Pine Cliffs, dramatically set on the cliffs overlooking one of the best beaches, Salgados, awash with scintillating water hazards, and Penina. The Algarve's oldest course, Penina is one of several Portuguese courses designed by Sir Henry Cotton, who, as one of the greatest golfing figures in the 20th century, is to Britain as Robert Trent Jones is to the USA. Near the western tip of the Algarve is Parque de Floresta whose hilly terrain calls for a good temper and a steady stroke.